Play Fruit Fortune online for free now! Jolly Joker has invited his 14 twin brothers in Fruit Fortune to dinner. What does the prankster serve? Fruit salad! Your job is now to support him and straighten out the fruity mess. And you will be handsomely rewarded with diamonds that the Joker has hidden between the reels. If all of the twin brothers actually show up they bring a jackpot as a present! 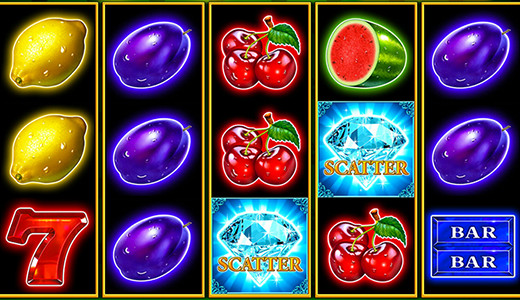 Your aim in Fruit Fortune is to line up 5 matching symbols along one of the 10 win lines. The winning lines run from left to right along the reels. The Diamond is the Scatter Symbol: It pays a line win and triggers 10 free games, if it lands at least 3 times in any position on the reels. The Jolly Symbol acts as a Wild and substitutes all symbols in the game except for the Diamond Symbol. 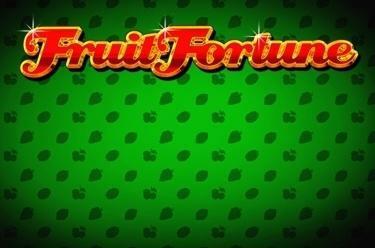 The Fruit-Fortune-Jackpot is yours if it lands 15 times! The Diamond Symbol (Scatter) can appear in any position on the reels and trigger 10 free games when you land at least 3 to 5 of them. You will play with the settings of the basic game. During the free games more Joker Symbols appear on all reels and increase your winning odds! You win further bonus rounds if 3 to 5 Scatters land again in the free games. If you manage to land 15 Jolly Jokers on the reels following a spin (Joker Symbols appear on all reel positions) you crack the progressive jackpot! You receive 100 % of the jackpot if you placed the highest bet or a proportionate share when you have bet less. What an exciting slot fruit salad!